Variety is key when mapping out food for a crowd, regardless of the event. Plan on serving one main course and two sides, and consider no-fuss options like chips and dips. If there are kids in attendance, make sure there is something neutral for even the pickiest eaters to snack on. However, try your best to avoid anything that needs a knife and fork to eat – finger foods typically work best. Heat oven to 375 degrees. In large, high-sided saute pan, heat oil over medium-high heat. Season pork with salt and pepper, to taste, and cook in pan 3 to 4 minutes on each side until browned. Stir in garlic and continue cooking 3 to 5 minutes. Pour in chicken broth, peaches and chili powder; bring to boil. Cover loosely with foil and bake in oven two hours. With slotted spoon, carefully remove peaches and transfer to small mixing bowl. Mix olives and mustard with peaches, set aside. Continue to cook pork in oven 30 to 60 minutes until fork tender. Allow to cool slightly, then shred by pulling apart with fork. Assemble sandwiches by spooning pork onto toasted rolls. Top with arugula and peach-olive mixture. Recipe courtesy of Litehouse, Inc.
Heat oven to 400 degrees. In large bag, combine flour and salt. Add chicken wings and shake to coat. Discard any leftover flour. Line baking sheet with foil and spray with pan spray of your choice. Place wings in single layer on baking sheet. Bake wings 40 to 45 minutes, turning halfway through. In saucepan over medium heat, combine soy sauce, sesame oil, garlic, two tablespoons water and brown sugar. Whisk together remaining water and cornstarch, and pour into sauce. Bring to boil then simmer until thickened. 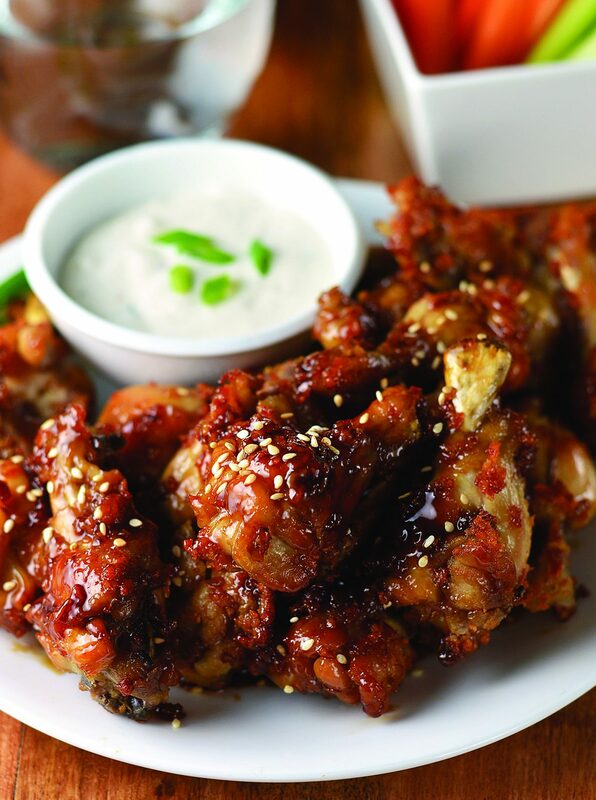 When wings are done, toss with sauce, garnish with green onion and sesame seeds, and serve with celery sticks, ranch and bleu cheese dressing. Previous ArticleColumn: Is Pacers is or are?